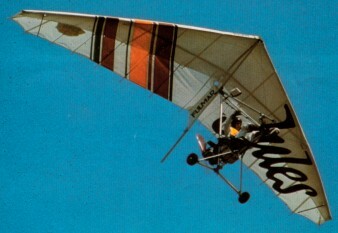 Single-seat single-engined flex-wing aircraft with weight-shift control. Rogallo wing with keel pocket. Pilot suspended below wing in trike unit, using bar to control pitch and yaw/roll by altering relative positions of trike unit and wing. Wing braced from above by kingpost and cables, from below by cables; floating cross-tube construction with 50% double-surface enclosing cross-tube; pre-formed ribs. Undercarriage has three wheels in tricycle formation; no suspension on any wheels. Push-right go-left nosewheel steering independent from yaw control. Optional brake on nosewheel. Aluminium-tube trike unit, without pod. Engine mounted below wing driving pusher propeller. The single-seater Trident trike, which incorporates a Rival 183 sq.ft (17.0 sq.m) sail, is the basic model of the Fulmar range. The Trident entry in the London to Paris in September 1982 was one of the most noticeable, not because of the quality of the pilots and the performance of the aircraft, though these were above reproach, but because the sponsor of the Fulmar team, Dior, had decorated the left wing of the Trident with 'Jules' logo in large letters. This has earned this single-seater the 'Macho Jules' nickname throughout most of Europe. The aircraft is offered ready built with a Hirth F-263R engine without reduction drive. This trike is also available with the same engine but fitted with a 2.611 reduction drive. Length overall 12.6 ft, 3.80 m.
Total wing area 183 sq.ft 17.0 sq.m. Wheel track 5.1 ft, 1.80 m.
Wheelbase 5.5 ft, 1.66 m.
Engine: Hirth 293 cc engine. Max power 23 hp at 3800 rpm. Propeller diameter and pitch 59 x 22 inch, 1.50 x 0.55 m.
Fuel capacity 2.6 US gal, 2.2 Imp gal, 10.0 litre in main tank; 4.0 US gal, 3.3 Imp gal, 15.0 litre in reserve. Empty weight 243 lb, 110kg. Max take-off weight 464 lb, 210kg. Payload 221 lb, 100 kg..
Max wing loading 2.53 lb/sq.ft, 12.4 kg/sq.m. Max power loading 20.2 lb/hp, 9.1kg/hp. Never exceed speed 50 mph, 80 kph. Max cruising speed 37 mph, 60 kph. Economic cruising speed 32mph, 52kph. Max climb rate at sea level 400 ft/min, 2.0 m/sec. Min sink rate 344 ft/min at 30 mph, 1.7 m/s at 48 kph. Landing distance 65 ft, 20 m.